Time infuses garments with parts of life and memories. Looking how time passes behind a personal garment, clothes, the possibility to recall memories, experiences, and attachments appears as a bridge to cross. Connecting our past and the world around us. This film glimpses a metaphor about departure and emigration. What does it mean to leave behind emotional bonds and bury them in a ritual or sort of poetic act, perhaps a way to emancipate emotions. 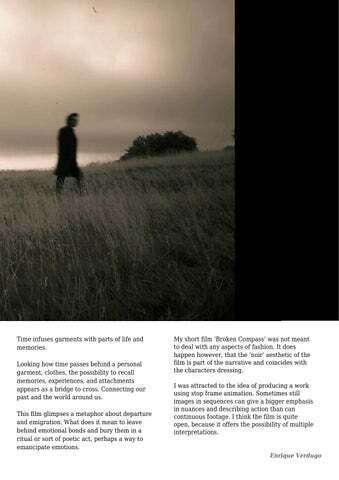 My short film ‘Broken Compass’ was not meant to deal with any aspects of fashion. It does happen however, that the ‘noir’ aesthetic of the film is part of the narrative and coincides with the characters dressing. I was attracted to the idea of producing a work using stop frame animation. Sometimes still images in sequences can give a bigger emphasis in nuances and describing action than can continuous footage. I think the film is quite open, because it offers the possibility of multiple interpretations.